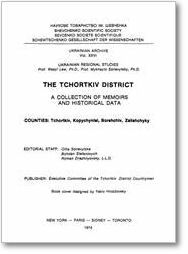 In 1974, the Shevchenko Scientific Society published “A Collection of Memoirs and Historical Data”, one of which focussed on towns and villages in “The Tchortkiv District” (Ukrainian Archive, Vol. XXVI). In that publication, Lonhyn Horbachevskyy wrote a detailed chapter of reminiscences about Tluste/Tovste, covering some 14 pages (pp. 795-808). Among other things, he tells about prominent people who visited Tluste, such as Grand Duke Myhaylo Romanov, brother of Tsar Nicholas II, the last Tsar of Russia. Horbachevskyy also describes the events of the First World War, including the use of biological weapons on the front line, which was situated not far from Tluste. Although Horbachevskyy was not actually born in Tluste, he moved from Kolomya to take up residence in the town in 1902, and he spent the next twenty years of his life there. After graduating from the University of Lviv in law, he returned to Tluste to do his practical training. Among other things he worked at the Prosvita or ‘Enlightenment’ library, which was located in the community centre (presently the museum), where he systematized the books. He was also conductor of an amateur choir and he organized a chorus, the first concert of which took place in 1911. In 1916, Horbachevskyy became an officer in the Austrian army, but he returned to Tluste in 1918 after two independent Ukrainian republics were declared. Horbachevskyy moved to Chortkiv and took part in the war in which the Polish army was victorious, dashing the hopes nationalists like himself. His brother was a lower officer in the Ukrainian Sich, and was killed by the Bolsheviks. Around 1920-22, Horbachevskyy moved to Central Ukraine, where the independent republic was still viable, and was married there. Persecuted for his beliefs he decided to return to Tluste but was arrested by the Polish police and was imprisoned, then released. He moved finally to Chortkiv where he continued to do social work, helping to found a Ukrainian gymnasium (school) there. He continued to visit Tluste, just 20 km to the south, regularly. There, his father was director of the local court. Horbachevskyy emigrated to Canada in the 1950s and died in Montreal in 1971. Whether he ever returned to Tovste or published other material about his life in Ukraine is not known. Nevertheless, the single chapter of his reminiscences about Tluste/Tovste, written in Ukrainian, is an extremely valuable source of information. It is hoped that it can be translated into English and made available to a wider audience. If you would like offer to translate the Horbachevskyy chapter from Ukrainian into English or to make resources available for its translation, please drop me a line via the Feedback page. INTERIM UPDATE: One of Lonhyn Horbachevsky's grandsons, Myron Horbachevsky (of New York), contacted me in March 2010 to report that he was in the process of translating his grandfather's memoirs (from 1963) into English and has offered to revise and augment the information mentioned above. Pawlyk, J. History of Tovste. Chortkiv, 2000. pp. 42-43, and pers. comm.